In the August 9, 2016 edition of the "E-News Commentary" published for members of the NCGR, astrologer Bob Marks explains that the chart for Dixville Notch, NH, on midnight the morning of a US national election, is the chart for the election as a whole. This small town opens its single polling location before any other in the country and therefore begins the election. Marks writes that this election chart has indicated, without fail, the winner of the presidency since Dixville Notch began its early-polling tradition in 1960. Marks reports that when the Ascendant or Midheaven of this election chart is afflicted by one or more outer planets, the currently reigning party will lose the election. Because, he writes, this upcoming election's chart is devoid of such afflictions, the Democratic Party and its nominee Hillary Clinton will win. I have examined many of these Dixville Notch election charts and will attest that there does seem to be a pattern. Mars (technically not an outer planet but prominent in many of these election charts) is quincunx the Ascendant. Saturn is "squine" (105 degrees) the Ascendant and widely conjunct Venus, ruler of the Midheaven. Uranus is quadrinovile the Ascendant. Neptune is widely opposite the Ascendant. Pluto is sesquiquadrate the Ascendant. Tight minor aspects and wide orbs for major ones... but quite a few of them. On top of this pile-up of apparently weak factors, we have Jupiter in the Second House (hinting at an economic recovery more likely under massive tax cuts), Uranus parallel the North Node (hyping up the possibility of unexpected change), and Pallas square both Mercury and the Sun and ruled by the North-Node-aspected Uranus (suggesting a strong libertarian vector). Add these to the factors we discussed last week, and we have something less than a slam-dunk for our physically ailing would-be first woman president using the Dixville Notch election chart. 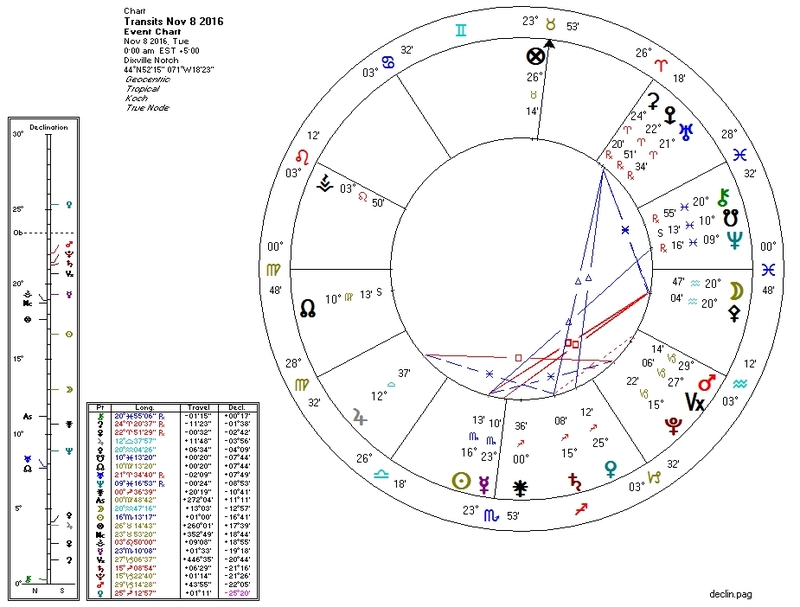 Traditional astrologer Nina Gryphon also predicts the election will go for Hillary Clinton, but in her post she mentions a striking caveat in the chart for prediction. The post is worth reading and the caveat involves the ruler of the Fourth House conjunct the Midheaven on the 2016 Aries Ingress chart. While Gryphon does predict a Democratic Party win, she ends her article with the words: "Outcome: TBD! ".